Fairweather Farm is a small homestead/farm located in Oregon’s Willamette Valley. 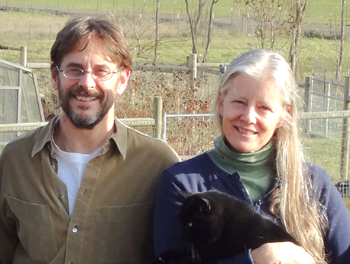 Jay and Lisa are devoted to creating a diverse environment of food production, for our own use and for sale. There is nothing as good as home-grown food! We sell tomato and other plant starts in spring (custom-order), and honey in fall; we also sell eggs year-round, and sometimes have sheepskins, fleece and wool, and lambs, chicken, turkey, or ducks available. We also work full-time from home, please keep this in mind when contacting us. In 2009, Fairweather Farm moved from Jackson County in southern Oregon to our current place in Linn county. While these two farm locations have many similarities, and we have much the same goals and philosophies (and brought with us much of the farm paraphernalia), the farm mix did change. This might be particularly noticeable in the blog posts.